Last night I had the opportunity to see two lovely authors, Liara Tamani (Calling My Name) and Lauren Oliver discuss Lauren's new book Broken Things, which is out now, at Blue Willow Bookshop. I was so happy to catch the event while I was in town. Along with a delicate (so many spoilers to dance around!) discussion of the Slender Man inspired Broken Girls, there was plenty of good writing advice and laughs to go around. When talking about craft, both authors were quick to admit they were not the authority, and some of the most common questions about writing just don't have good answers. Lauren discussed how the three act structure is how everything from books to movies to songs, and even jokes, is understood. Even if you don't like plotting, the recognizable structure has to be in the book for it to work. Sometimes it's easier than others as she contrasted the fluid outlining of Broken Things compared to the "murder board" she assembled for Replica. as to write and which ones to give to Glastown, her development company, "one of them starts talking." This is why her process includes writing 10-15,000 words just to discover if the story is working. My favorite thing that Lauren said, and something people seem to fail to understand about all kinds of art, is that your not just born good at it. "People have a weird thing about writing where they think it's different than everything else in the world... Writing is practicing the intolerable feeling of being bad at something you love," she said. I'm not sure I've ever heard someone more accurately describe what it is to be a writer. She continued to say, "You're not supposed to be good, you're supposed to work for it." And that's what divides an aspiring writer from a writer. It's just time doing it. It also goes hand in hand with a chance at failure, and willing to fail also helps define a real writer. Mistakes lead to innovation as Lauren so eloquently stated as, "Write into the gap of what you want to do and what you think you can do." I can't wait to dive into Broken Things (and post my review) soon! 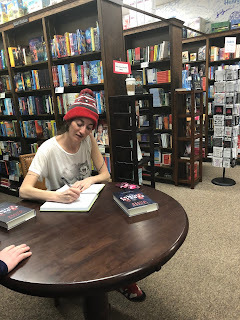 Not only does the book sound amazing, but Lauren's kindness and honesty last night assured me that the book will have that genuine feeling that all my favorite books do. I've been to many conferences and events with authors, and few have ever taken my questions about querying and publication as seriously as Liara and Lauren. She was so sweet and encouraging when she heard about my novel projects, and she never put me in that "teenage" box that adults like to relegate young people too. All my favorite books come from authors who just see teens as people like them, and I walked away from the evening feeling refreshed and reinvigorated to write. Have you gotten the chance to read Broken Things yet? What are you reading? Let me know in the comments. Last night, Liara shared she's finishing up Eleanor and Park and Lauren is working on Strange The Dreamer by Lani Taylor.